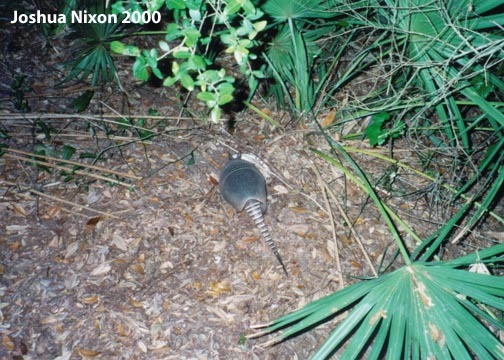 On a trip to Florida in 2000, I had the opportunity to photograph the wily armadillo in its native habitat. I planned my armadillo hunt carefully, making sure that I had both a camera and film. However, I neglected to bring a flashlight. Did that stop me from locating and capturing on film this most cunning and elusive creature? Of course not! With faith, perseverance, and blind luck, I was able to waste most of an entire roll of film on pictures of darkness and vegetation. Upon closer examination of the film, I realized that I had obtained more armadillo photographs than I had expected. Read on, and be amazed at my photography skills! As this was a business trip, I spent most of my time doing important science things. Just what these things were escapes me at the moment, but they took up most of my day. Upon exiting a late night get-together I began my armadillo hunt in earnest. Equipped with a camera, I searched for a specimen, but I found no armadillos willing to be photographed. I was beginning to think that they were camera shy. I was about to give up and go to bed when I spotted one, foraging near a swimming pool. Using my supreme woodsman skills, I was able to creep close enough to take a few pictures without warning it of my presence, despite a thick layer of leaves on the ground. How did I remain so quiet in the leaf-filled woods, you ask? I used an old Boy Scout trick — I walked on the cement pool deck. Here’s what I saw. I watched this armadillo nosing around in the leaf litter for about two or three minutes before it noticed me. It looked up, squinted in my general direction, sniffed a few times to make sure I was really a person and not a tree, and then ran off into the darkened woods. Because armadillos are such fascinating creatures (especially to those of us who live where armadillos do not), my story naturally got lots of attention. The next night, after dinner, I had help in my efforts to track the wily armadillo. My friend Tammy (then a graduate student at the University of Michigan) accompanied me out into the armadillo-infested woods of Amelia Island. (By “woods” I mean the narrow strip of trees and brush between the boardwalk and the roadway.) As soon as we stepped off the road, we glimpsed an armadillo in all of its majestic glory. As Tammy focused on it and I crept closer, it suddenly ran under the boardwalk and out the other side. I realized that there were two of them, a fact made very clear several seconds later, as one chased the other across the pathway and into the woods on the other side, practically running over our toes in the process. 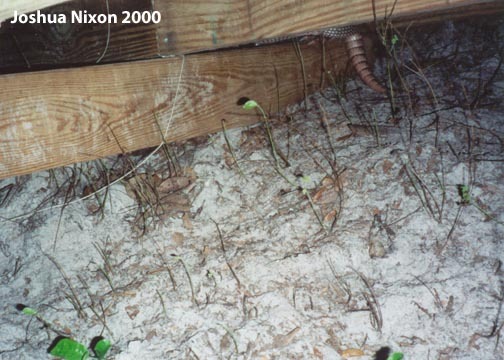 We tracked them by sound for a while, eventually cornering one underneath the boardwalk. Tammy actually nudged it with her toe at one point, trying to stir up the leaves and make it move. She didn’t realize in the darkness that the pile of “leaves” she was poking was in fact the armadillo. I snapped pictures in the general direction of every armadillo-ish sound I heard. Upon developing them, I was surprised to see that two of the pictures actually contained an identifiable portion of armadillo. The first photograph was a random shot into the woods; the second was taken while hanging upside down over the edge of the boardwalk. 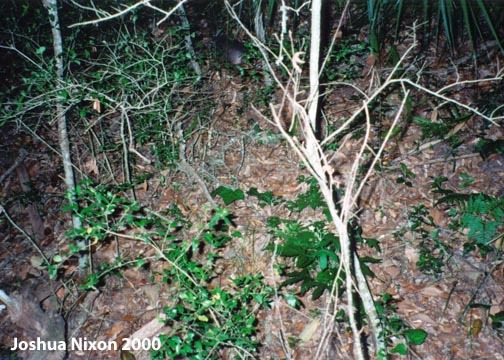 Can you locate the armadillo in each picture? Well, that’s it for this trip. The next time I am in armadillo country, I will fire up my camera once more. I will also seriously consider bringing a flashlight, so that I have a better chance of getting more pictures of armadillos than of dirt and leaves. Have you had your own encounter with an armadillo? You can probably see from the pictures above why I depend on other people for the majority of the armadillo photos on this site! 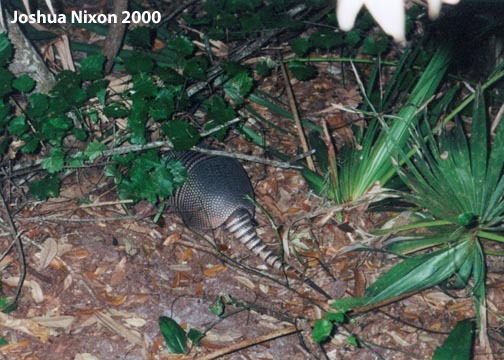 I always appreciate armadillo photos submitted by my readers. I am especially interested in pictures of armadillos that are not currently featured on this website. For a list of these animals, see the Armadillos Wanted page. To submit an image, see the Contact page.